Rinses away with ease conserving water and time! 3D Pink Car Soap will help you safely remove contamination from your vehicle during the wash process! This shampoo is tough on dirt but gentle on your paint. Pink is pH balanced and will not strip off waxes, sealants or coatings. It will, however, provide a great deal of lubrication and suds that will help encapsulate dirt and grime, allowing you to safely remove contaminants while minimizing the possibility of introducing wash-induced imperfections. Another strength of this product is its "rinse-ability" because it has no added oils or gloss enhancers it rinses off incredibly easy conserving water and your time. With the gentle nature of this pH balanced formula it's a great maintenance shampoo that you can use daily, weekly, monthly or however often you prefer. 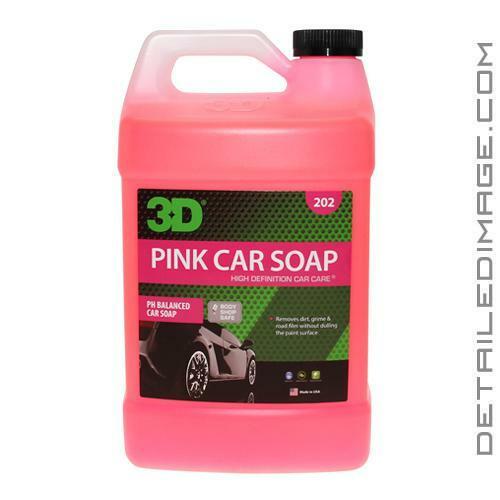 The 3D Pink Car Soap is a well-balanced shampoo that has everything you need for a high quality car wash so pick up a bottle today and get the most out of your wash! Removes dirt, grime & road film without dulling the paint surface. DIRECTIONS: For best results dilute 1 oz per gallon and use high pressurized water to create rich foam. We recommend using a wash mitt to apply product to the car surface. Start from top of car and work your way down. Rinse off and dry with a soft, clean towel or chamois. Full Service Car Wash: Depending on your water pressure and car wash system, your setting may be different. Start with the lowest tip (pink tip; 200:1) and work your way up until the desired foam is reached. NOTE: 3D Pink Car Soap is a thick product and a larger tip may be required. Great soap at a great price! I use 2oz in my cheap foam cannon and get pretty good foam with my electric pressure washer. It removes a lot of the grime and grit safely. It even removed all of the pollen and tree gunk from a vehicle that was waxed with Collinite 845 not too long ago that hadn't been driven, which made cleaning it much easier. It definitely doesn't remove any waxes or sealants (and seems to be safe on coatings), while also not seeming to leave anything behind, which is exactly what I was looking for. I cannot express how disappointed I am with this product. We used this in a professional detailing studio, and found that with our Kranzle pressure washer and MTM foam cannon, the lather was not only poor, but the soap slid off the paint almost immediately. We followed the directions and had almost no foam whatsoever. We even increased the dilution up to 4x what the instructions recommend, to no avail. Additionally, there was almost no lubricity when wiping the car with a wash-mitt. We will no longer use this as we strive to provide jaw-dropping results for our customers and this fell way short.